Lynette picks me up at 6.15am, bikes are already loaded as I took mine round to hers on Thursday night. The dreaded porridge has been consumed (with chia seeds and blueberries) and the sun is coming up as we drive over the old Severn Bridge to Chepstow, with winking red bike lights on the cycle lane as the tough hardy souls riding to the start roll across. No crises as bikes are unloaded, control cards collected, but all day parking tickets purchased and displayed and fellow BRCC members Simon, Stu and Kate and James are spotted and chatted with. Unfortunately we are one intrepid member down who is very definitely ill and has turned home, get well soon Russ. A mass start of around 130 I think. The weather is looking good this morning, with forecast showers and increasing south westerly winds this afternoon. No snow. Stage 1 Chepstow to Monmouth 28km 404m includes the only info control point. All other evidence of completion will be our control cards being stamped at the 3 control points (cafés and pubs) and at the end. The two sharp ascents out of Chepstow do not allow for a nice gentle warm up. Again I am very slow and steady and Lynette is somewhere off in front. A gathering of the distinctive yellow and royal blue Weston Wheelers jerseys in a lay by indicate a puncture already, or early hedgerow breaks? Of course that was the info control point, we forgot about checking the signpost for the Offa's Dyke long distance path. Kindly Weston Wheelers divulge the answer so all is well. We chug along, up and down and admiring the beautiful scenery through St Briavels to our first control at Henry's Café in Monmouth. An early stop at just 28km, but I didn't make the same mistake as last year and we made sure to stop for coffee, even if we were already well back in the field <audaxes are not races> Very nice latte! First stamp into our control cards and chatted with Chrissy and Katie from Weston Wheelers who I have "seen" on Strava but never met, they are inspiring cyclists and ever so lovely and friendly too. 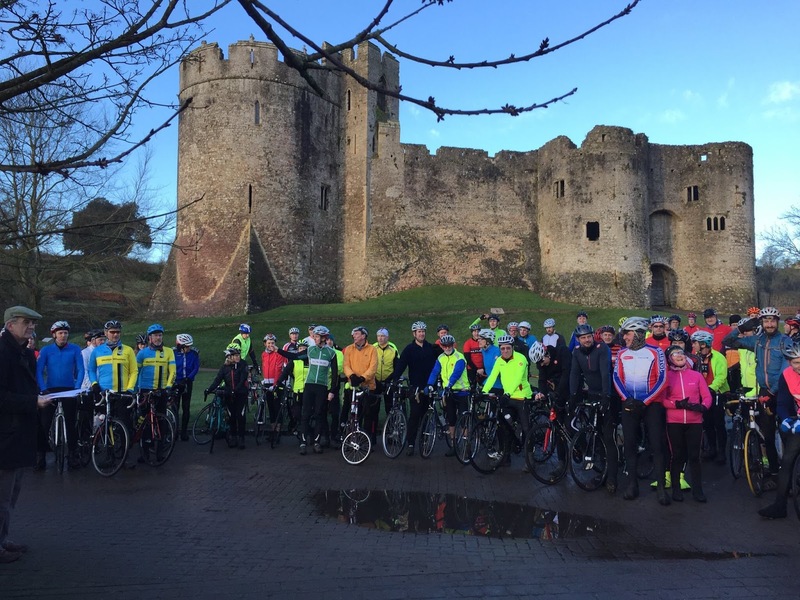 I dubbed the Weston Wheelers chain gang the "hares" as they shot off, stopped at the info control and we all came into Monmouth at about the same time. So now our audax can properly begin after coffee! The sun was appreciated, felt silly having heavy winter waterproofs stowed away at this point. Could you do Gospel on that? Not quite as much ascent on the Monmouth to Hay-on-Wye section, but it is steady, and we get into the groove. Lynette is off again and I resist the temptation to keep up, I will not make it if I go too fast. I tend to get stronger as the day goes on, but not faster! The lovely lanes dip too and from from England to Wales and back again several times. The wind is getting up and we do enjoy a bit of a tailwind into Hay but not much compared to the headwind for most of the rest of the day. The best Cherry and Almond Cake, allegedly. Tic 674 is for my beans! A nice surprise in Hay. My parents are down from Cumbria for a few days, and said I was to carry on with my plans, so Steve did bring them over for a drive and they arrived at The Granary Café in Hay on Wye just before us. Steve did say he thought we should have been making better time, as I had texted to say when we arrived in Monmouth and he thought that was leaving time. Smug git! 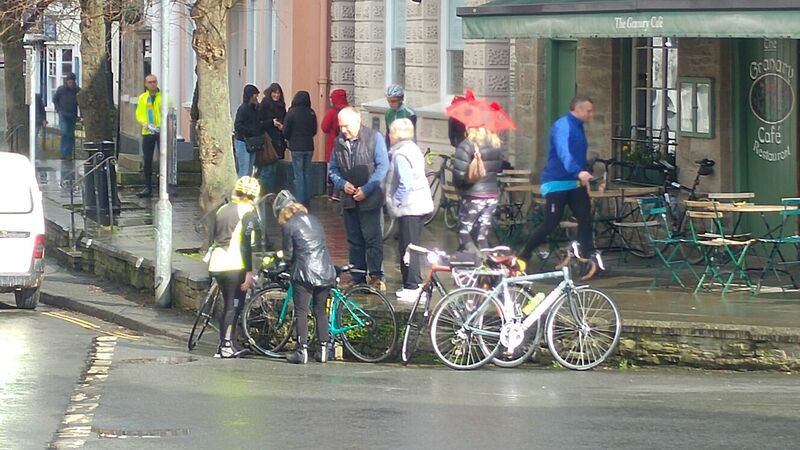 We rolled in with the Weston Wheelers again, and also saw Kate and James who had already consumed beans at another café as Granary was heaving. Fortunately the rush was easing and we did wait and order a selection of cakes (everyone else) tea and sensibly I ordered beans for me. Mum dad and Steve set off to mooch in the book shops and Lynette and I head off out to find it raining, but the road is indicating we have just missed a very torrential downpour. The majority of the field will be up on Gospel Pass, it does pay to be tortoise like sometimes. Heading out from Granary café with my mum and dad wishing us well. With dropping temperatures and strongish winds even in the valley, we set off through the high hedges and past fields with newborn lambs as the climbing starts in earnest. There was a fair amount of traffic and other audaxers and getting up in one go without stopping may be a tall order. It was hard going, at one point several cars halted on the steepest bend and somehow I weaved round everything and kept going, there would have been a slow domino effect of everyone having clipped in falls otherwise. The hares were slowly passing us. Knowing that the climbing eases up after the treeline made me a bit complacent but the strong headwind hit us as we pulled up and it was a long flog, the last steep pull nearly finished me off, as my parents passed by with a cheery wave from open windows. I was very giddy by the top, and annoyingly hadn't realised that the official Strava segment finished 100m down the other side, I should have kept on going to get an accurate time. Never mind. Lynette arrives seconds later (she had to unfortunately stop for those darned cars) and the Weston Wheelers, and a large walking party gave us all rousing applause. I wondered where the Gospel Choir was, but it was lovely that it was more of a joint celebration of achievement. The highest road pass in wales, Gospel Pass DONE! Cereal bars munched, all our layers on for the chilly, wet and cold descent. I lead the hares and the tortoises, glad to have a free view of the road and nice that no idiots came screaming past descending at speed. The road was like a river bed, and my chain was grinding and crunching in an alarming manner on the occasional turn of the pedals. We met a tractor, several cars and a very scary incident of a quad bike with a sheep dog running free alongside coming towards us at a lick of knots. The sheep dog was unflappable and no incidents other than passing other folk with punctures. We continued through the trees towards Abergavenny and turned the corner onto the main road, still into the wind. The Weston Chain Gang chugged past and Katie said "get in behind" I just managed to hang on for a tow into Abergavenny, or more accurately Mardy. I did not miss the pub this year like I did last year, and we pulled into the Crown and Sceptre, hares and tortoises together. I could not feel my feet at all. Lynette is very slight, a real athlete, she was feeling the cold even more. Large mugs of tea and we slowly came too a little. I'm getting quite concerned that it is nearly 4pm and Lynette doesn't have lights. The next 25km are OK ish but then there is one heck of a long grinding climb for 10km before the final descent. I have had helmet lights on all day flashing away,and make sure my industrial commuting lights are fixed on now and used for extra safety as the light is very dull. The pleasant 25km are dispatched efficiently enough, taking it in turns to lead out. Our Weston pals left before us so we were fairly on our own now. We turn left at Usk and eat something (me) and Lynette downs a caffeine laced gel. I could not revisit gels. I have still only ever consumed one gel in my cycling career, at this point in the audax last year! I shield Lynette from the traffic (because I have lights, illuminating her reflective stripes on her legs) up the long steady climb. We do not have sufficient daylight time to turn off and do the extra bit on the lanes at the top and stick to the main road. The descent is exhilarating, smooth fast and crud free the road has dried out and there is very little traffic.We havd passed the tandem at the bottom and know we are not last. We arrive in Chepstow, turn into the Three Tuns pub bang on 6pm. The latest finish time, so we are legal (ish) Reunited with the Weston Wheelers who did the little extra (and then ride back across the bridge after final control) A great day. We thanked the lovely patient organisers, got our cards stamped and left them for validation. We should get them back in the post in a few weeks. I love my collection of audax cards with fun stamps. A quick wobbly selfie in front of the castle a the sun sets. We are very pleased with ourselves. We wrestle the bike rack back on to the car, load the bikes and we're on our way. My right foot finally thawed out in the shower at home two hours after the finish. Left foot pink, right one white. No lasting frostbite. Chinese takeaway and red wine devoured. The Gospel Girls had a great day out, and I was relieved we were not last, and we had no mechanicals or accidents. Thank you Lynette! March Strava Gran Fondo also completed, that's 15 months in a row now.